Black chokeberry (botanical name, Aronia Melanocarpa) is a short-lived deciduous herb that grows up to a height of anything between 2.5 meters and 3 meters. The herb branches effortlessly and has a shrub-like appearance. The stems of the black chokeberry are woody having a brown to grey color that turns out to be more uneven or creased as it ages. The shrub bears alternate, oval-shaped leaves that are about four inches in length and around 2.5 inches in width. The elliptical leaves are delicately jagged along the margins, but do not have any hairs or bristles. Frequently, these leaves of black chokeberry are found to be most expansive further than the middle point and possess small thick tips. The leaves of black chokeberry have a comparatively pale green hue on the underside. The central vein on the upper surface of every leaf possesses minute blackish glands, which are properly noticeable using a hand lens. A thin petiole is found at the base of each leaf of the black chokeberry plant. The flowers of black chokeberry emerge in compound cymes from the upper and exterior branches and each cyme contains approximately 12 flowers. However, their profusion differs. 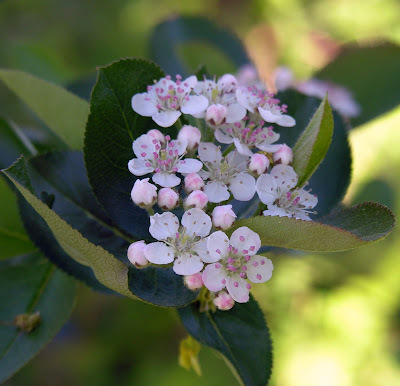 Every flower of black chokeberry is approximately half an inch in diameter and comprises of five white rounded petals, a reddish green calyx having five small teeth. Each flower of black chokeberry also has about 16 stamens encircling the styles positioned in the middle. The anthers of the stamens are prominent and have a pinkish hue. Although the individual flowers are somewhat small, they are produced in large numbers. The black chokeberry plants bloom during the latter part of spring and the flowering season lasts for around three weeks. A black rubbery fruit, which is globoid and approximately 1/3 inch in diameter, replaces each of the fertilized flowers during the latter part of summer. These fruits of black chokeberry enclose numerous small seeds. The ripened fruits of the black chokeberry have a short life span and they fall on the ground quite soon after maturing. During the fall, the deciduous leaves of the black chokeberry change their color to vivid yellow, red or orange. The root system of black chokeberry shrub comprises a wood-like branching taproot. Although rare, plants of these species are sometimes found to develop into large colonies. Black chokeberry has a preference for damp peaty, swampy soil and likes to grow in full sunlight or partial shade. Although black chokeberry can thrive in most soil conditions, it avers shallow chalk soil. Compared to other members of its genus, black chokeberry has a greater tolerance for dry soils. 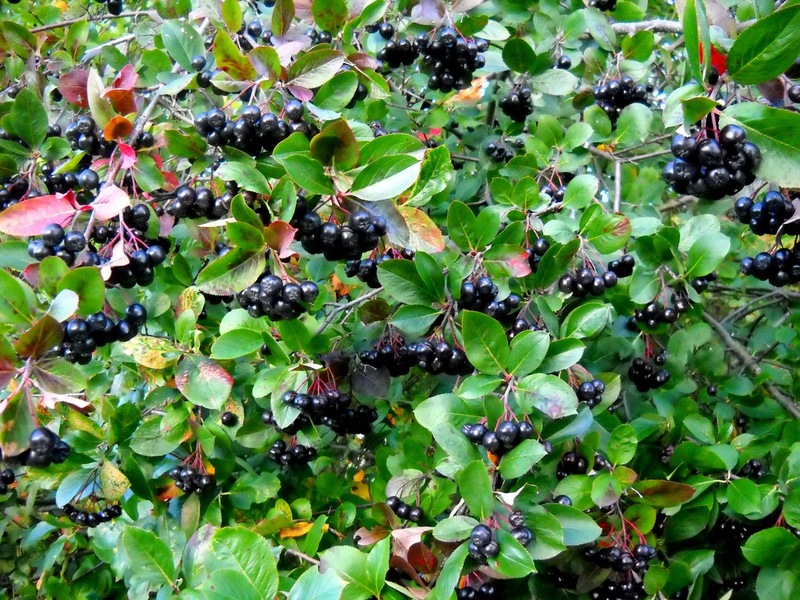 Black chokeberry plant is tough and can thrive in temperatures as low as -25°C. 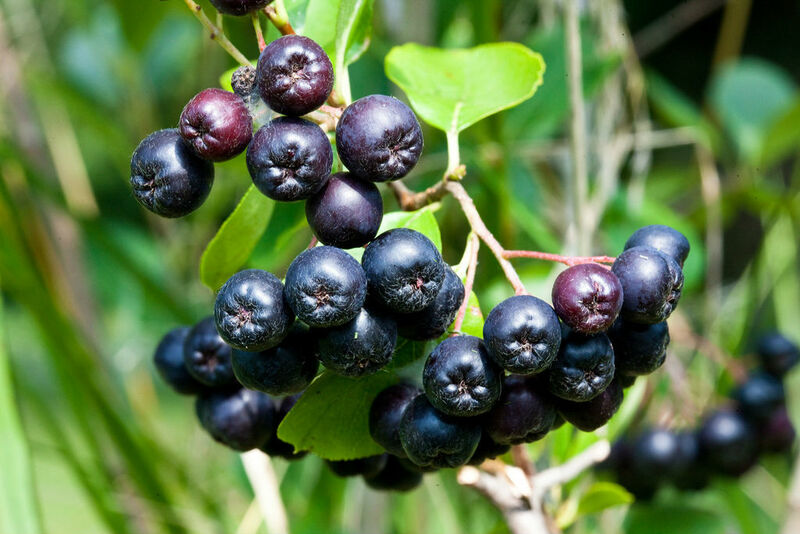 Black chokeberry offers a number of health benefits and, hence, black chokeberry has been traditionally used to treat several ailments and health conditions. An infusion prepared with the berries of black chokeberry is employed to treat colds. Findings of researches undertaken by scientists have revealed that consuming the berries of black chokeberry regularly provides several health benefits, such as combating cancer, inhibiting the aging process and treating inflammation, neurological disorders, bacterial infections as well as diabetes. Similar to the other familiar health promoting fruits, the fruits of Aronia or black chokeberry possess a rich content of red, blue, purple and also black pigments known as anthocyanins. These anthocyanins are known to have antioxidant actions and form a part of a bigger set of bioactive flavonoids present in all fruits and vegetables. In fact, although black chokeberry is connected with the blueberry, it possesses a much higher level of positive antioxidant activity. While black chokeberries have comparatively low calorie and fat content, they are an excellent natural source of vitamins, antioxidants, minerals and even dietary fibers. Apart from the health benefits offered by the black chokeberry, black chokeberry is also an excellent ornamental shrub owing to its striking spring flowers as well as attractive color during the fall and its fruits. 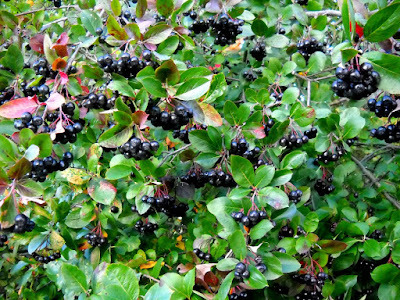 In many places, black chokeberry is grown as a shrub border. Black chokeberry is also of use when grown in clusters or massed in gardens comprising native plants, open forestland or when it is grown in naturalized areas where the plant's imposing growth habits should not be restrained. The black chokeberry plant has the aptitude to endure damp conditions making black chokeberry apt for growing beside the ponds, water gardens and/ or streams. The fruits of black chokeberry are cooked before consumption. The pleasant flavor of the black chokeberries also has a number of culinary uses. Although the berries taste good, they are extremely caustic. Hence, the berries of black chokeberry ought to be consumed when they are completely ripe, especially after one or two frosts - this is known to reduce the astringent property of the fruit. The berries are dried up and used to make pemmican, while an excellent jelly can be prepared by adding sugar to the crushed berries. Since, black chokeberries have rich pectin content, while making jams and other items with other fruits having low pectin content, these ripened berries can be mixed with those fruits. It is said that pectin is effective in protecting our body from radiation, especially the ultra violet (UV) rays of the sun.